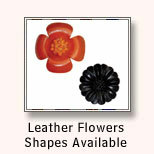 We offer comprehensive range of elegantly designed leather flowers for interior decorations. All our decorative leather flowers have perfect finish and are widely used in home decor items, garments, fashion accessories etc. We offer handmade leather flowers in various sizes, shapes, designs, color combinations, patterns etc to meet buyer's requirement. Available at the highly competitive prices, these handmade decorative leather flowers can be customized as per the specifications of the clients. Made with the premium quality of raw materials, we offer a wide variety of multi-colored decorative leather flowers in various shapes and sizes. These handmade leather flowers with glossy finish and great designs enhances the look of the ambiance.